I came to Boston and found knights. 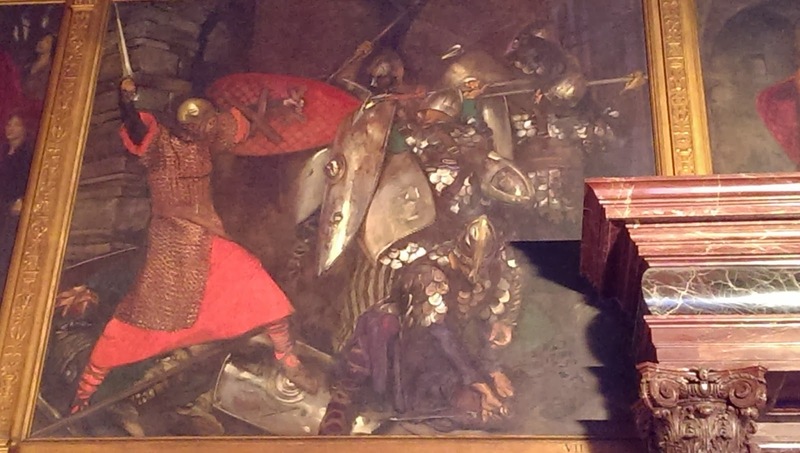 The knights above are getting walloped by Sir Galahad in a painting in the Boston Public Library. I have often thought that I might have knights in my family. The name Templeton has been attributed to meaning "place of the Knights of Templar". I've spent the last three days mostly at the Library researching names. Yesterday I spent hours trying to trace a family lineage. It seemed to have some ties in Massachusetts back to the 1600’s. The story just got better as I worked… one ancestor a founder of Concord, Massachusetts. He had sent three sons to Harvard University, one whom married the daughter of the President of Harvard. But here was the tricky part. My relative’s wife’s name was Mary and that didn't match with the name of the President's daughter. Not uncommon to have two wives back then and multiple children. At the moment of discovering this discrepancy, the library announced that it was closing time. I had been there since about 10:30 in the morning and it was now 9:00 in the evening. All the way home I wondered about these two wives. Why did he have one in Concord, be so well connected and then move to North Carolina to have more kids? At home I took up the search. The answer was that there were two men, similar names, similar birth and death dates and nary did their paths cross. If I am related to this illustrious family that I researched for hours, I’ll have to go back further to the Netherlands. No guarantee. After laughing at having spent so much time chasing “unattached guys” I went to sleep content at having a timeless day at the library. My seemingly “lost” hours researching unrelated people felt timeless. Early afternoon I had noticed the sun drenched skyscrapers outside of the window. When I looked up again, it was darkness of late evening. Hours like these have such a special quality. The beauty of them is the intensity with which one works while time passes. Hours like these are rare. I'll likely remember this day. I suppose if I could keep this day as if it were a ball in a bowl of special days, it would be blue ball with gold tracings and fake jewels! Knights. Back to Knights. 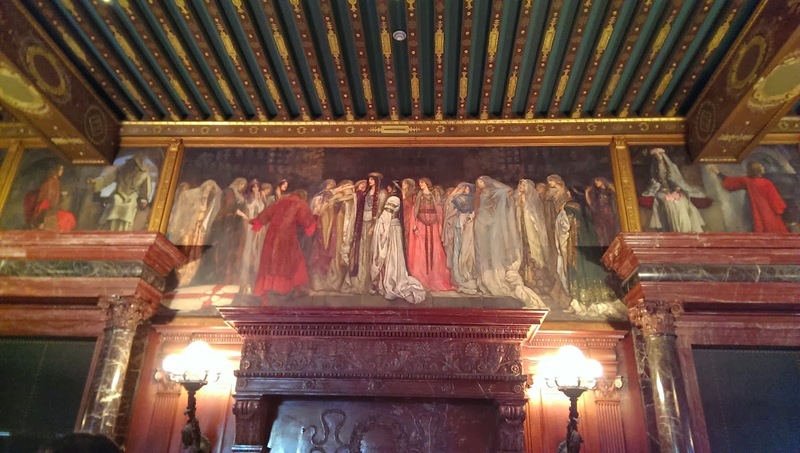 Today I returned to the Boston Library once again. Carefully checking lineage a bit closer, I began looking for names in a book called "English Origins of New England Families From The New England Historical and Genealogical Register". Ralph Denham, Esq. married Elizabeth Wentworth, daughter of Sir Thomas Wentworth, knighted for his bravery at the battle of Spurs, 16 August, 1513. A knight, a knight, a knight! In fact, in a glance I can count at least eight knights of Elizabeth's family lines, my family line. 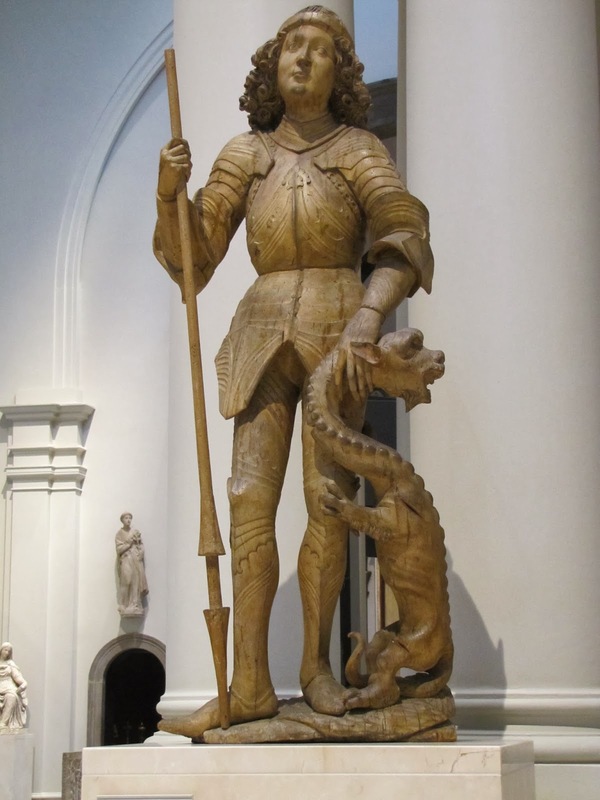 Knights were brave, but I think that the ones who crossed the ocean in the 1630's had to be as brave... both the men and the women. 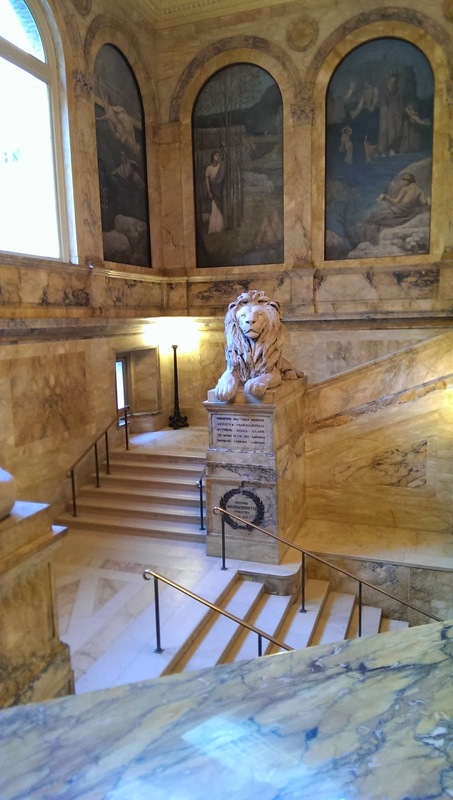 Post Script: Visiting the Boston Library has allowed me to get a temporary two-year library card. Today I used it in the Map Resource Room (22,000 maps) to find maps of Plymouth and of Leiden, Netherlands. 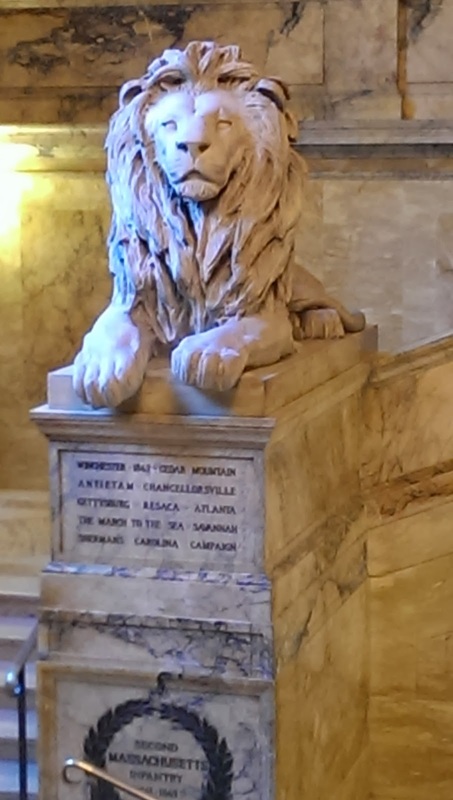 As one passes the lion on the stairs, one is supposed to stroke it's tale for good luck. I did that yesterday and I think it helped. Hi Kathy, I love Boston and Harvard's campus through your eyes! One question: Where is the puppet theatre? It looks interesting. Rose, the puppet show was staged at the Cyclorama in Boston. Here is a link to their show schedule: http://breadandpuppet.org/tour-schedule They apparently have been around for a long time.. running with lots of volunteers. The little Winthrop beach would be fun in the summer. Miss Boston!